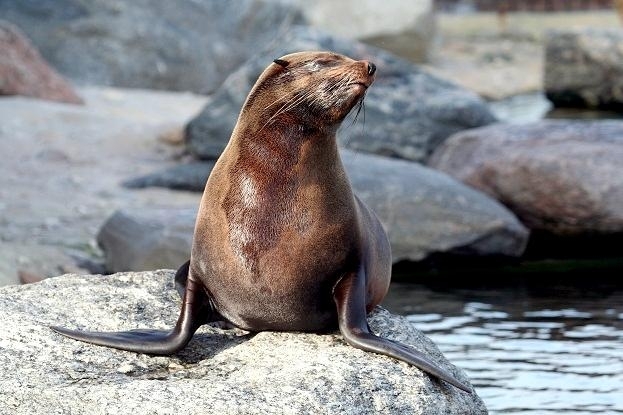 The Cape Fur Seal is also known as the South African Fur Seal. 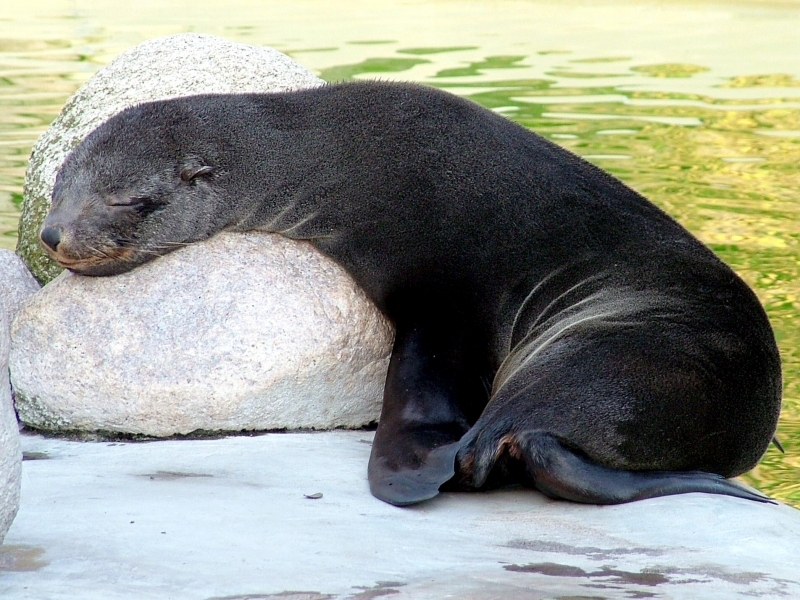 Males are an average of 2.3 meters in length and weigh from 200 to 350 kilograms. 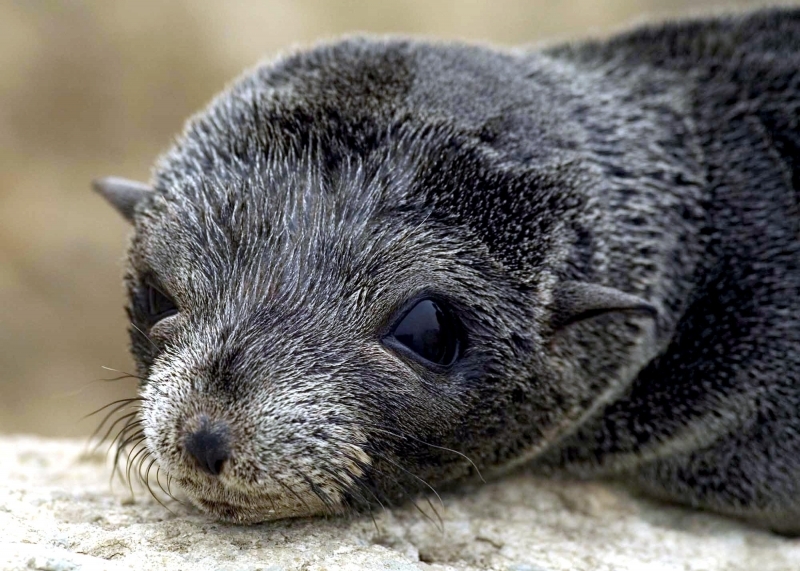 Their coat is gray or black in color and is lighter on the underside. 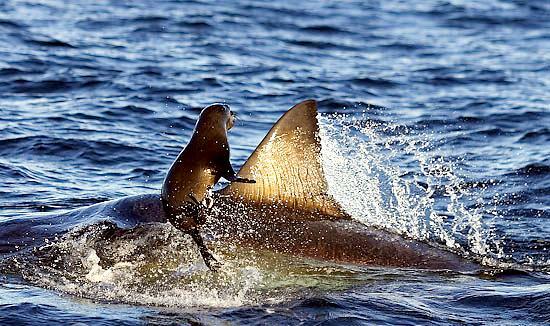 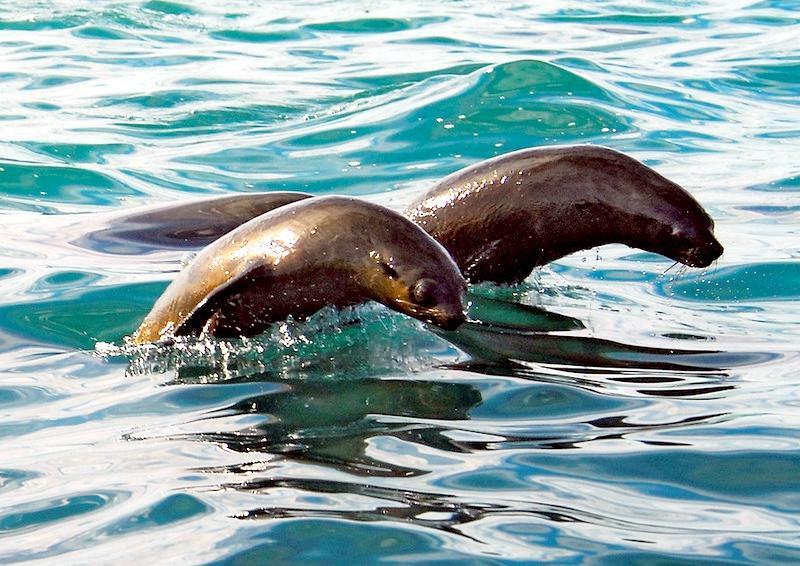 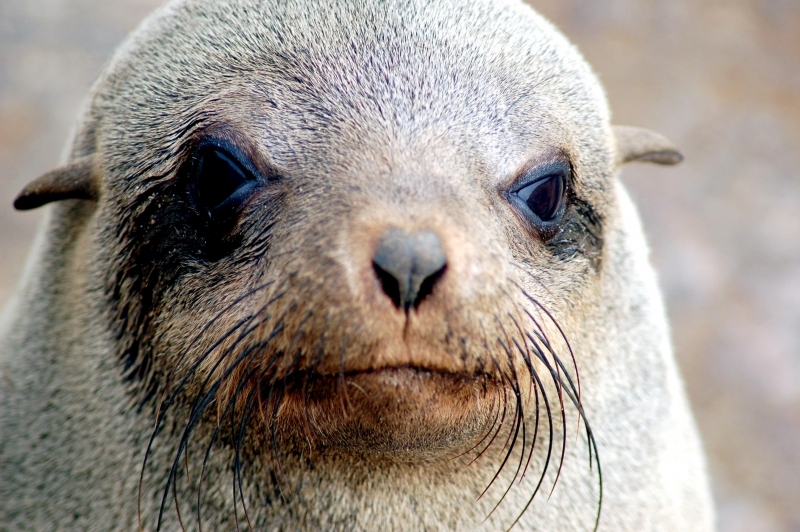 Female Cape Fur Seals are smaller, weighing an average of 120 kilograms and measuring an average of 1.8 meters long. 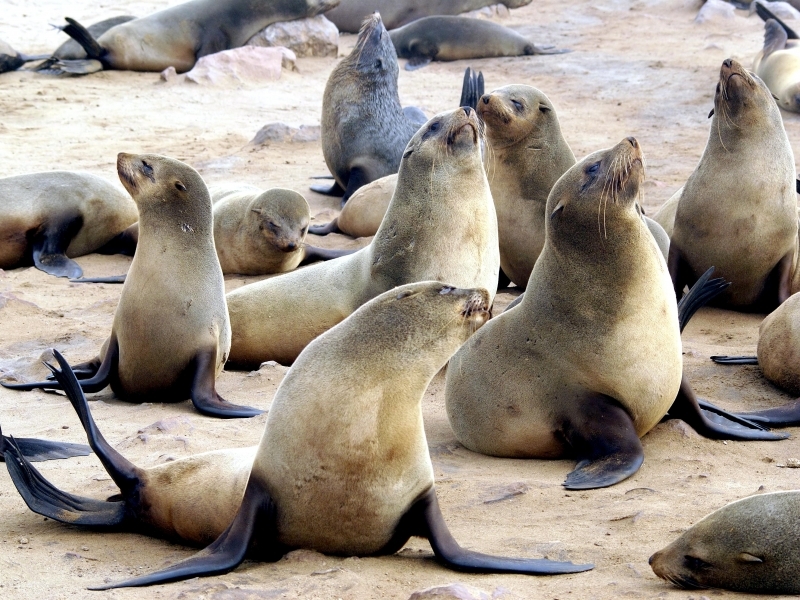 Their coats are brown with lighter shading on the underside. 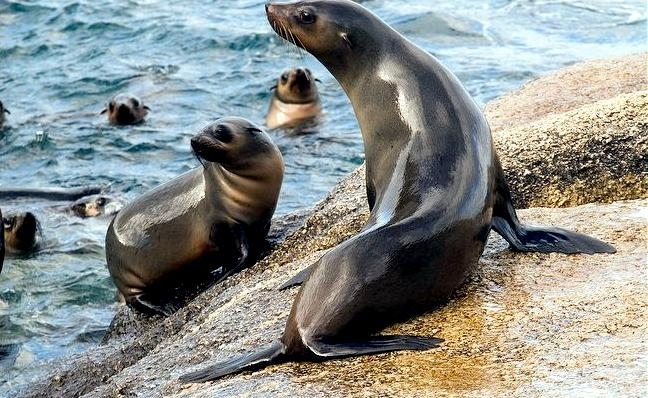 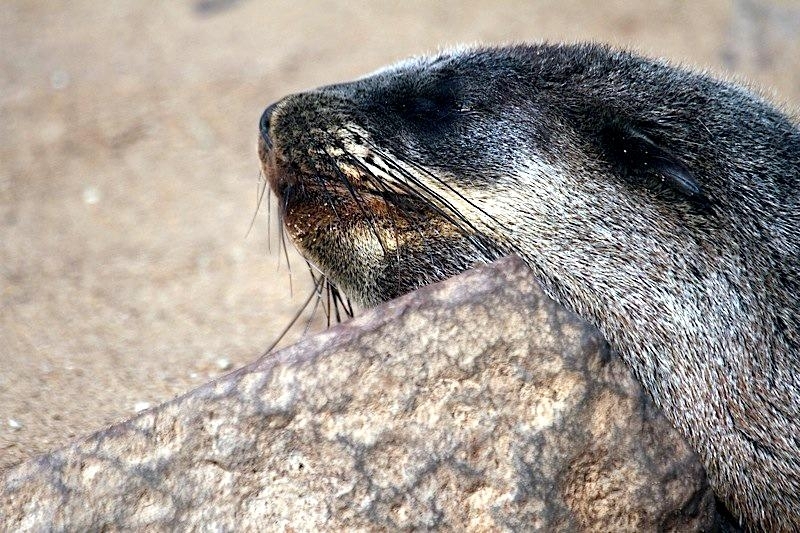 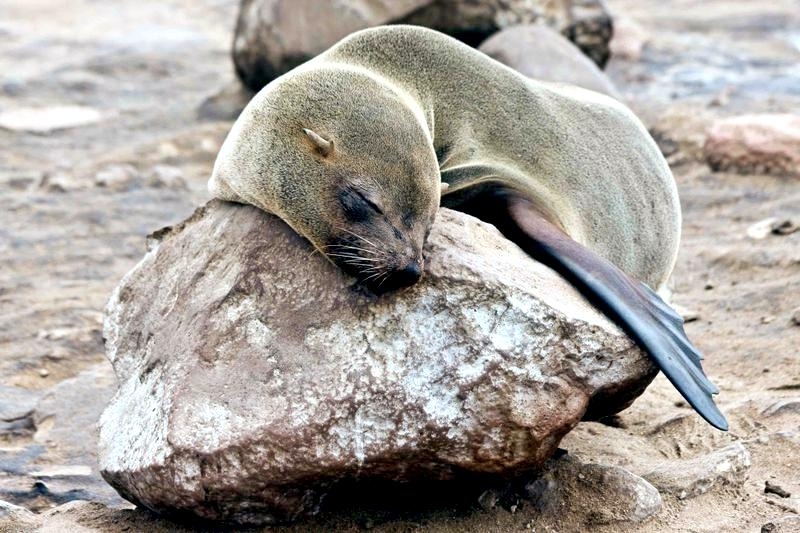 The breeding season for the Cape Fur Seal begins in the middle of October. 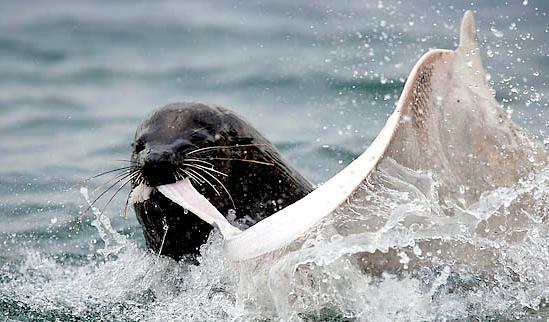 At this time, males haul out on shore at the breeding grounds or rookeries to establish territories by displays, sparring or actual battle. 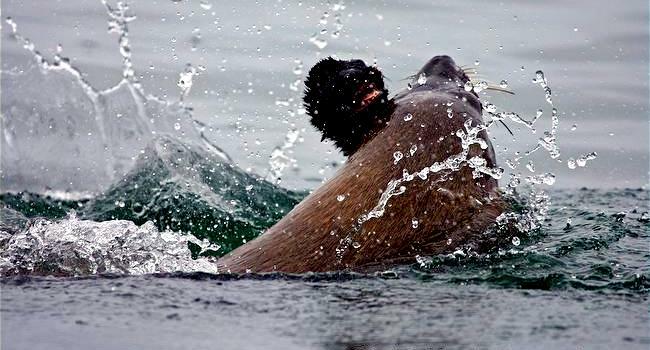 They do not eat again until they mate in November or December. 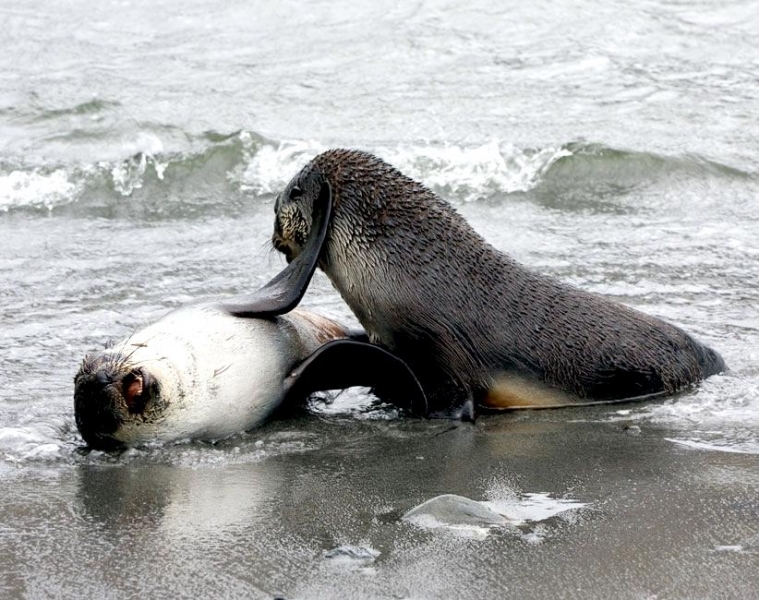 Females come ashore slightly later and also fight among each other for smaller territories in which to give birth. 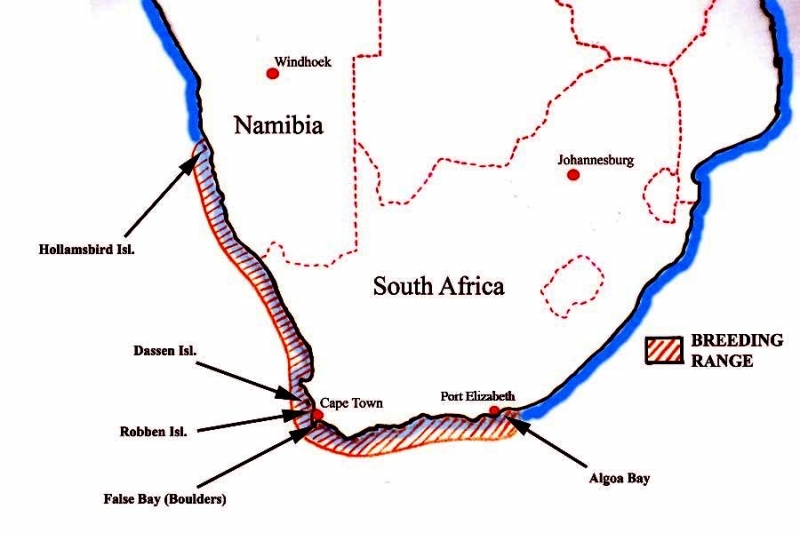 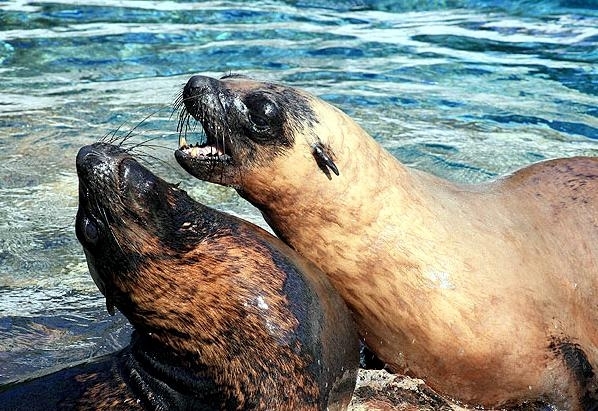 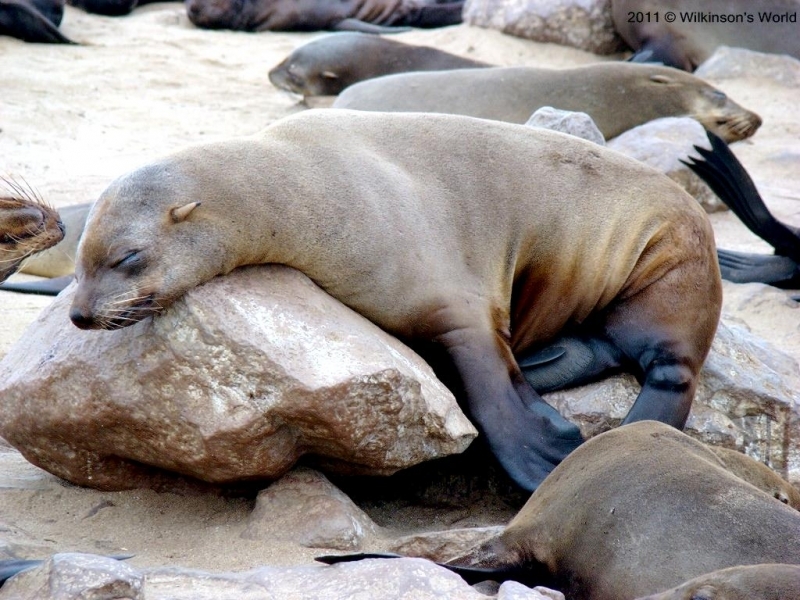 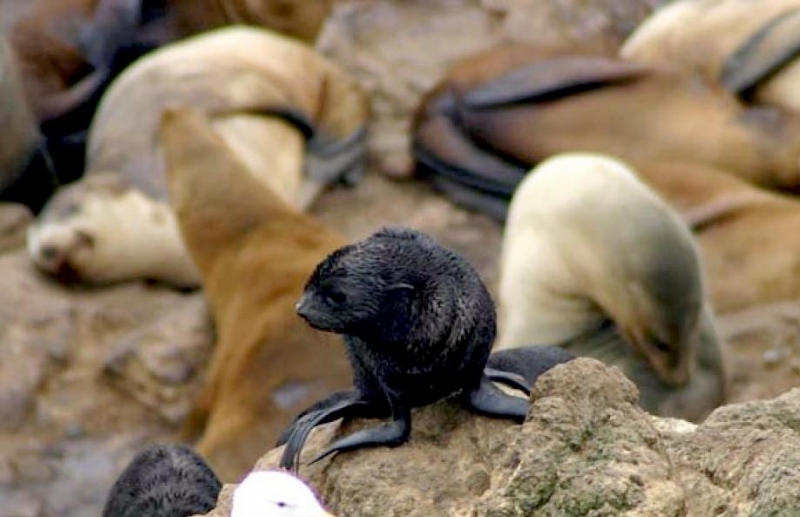 Female Cape Fur Seal territories are always within male territories and females who are located on a certain male’s territory become part of his harem. 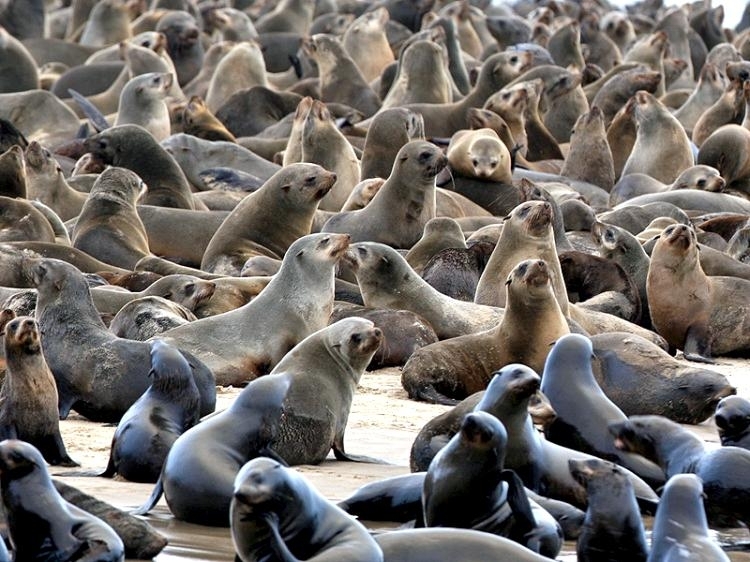 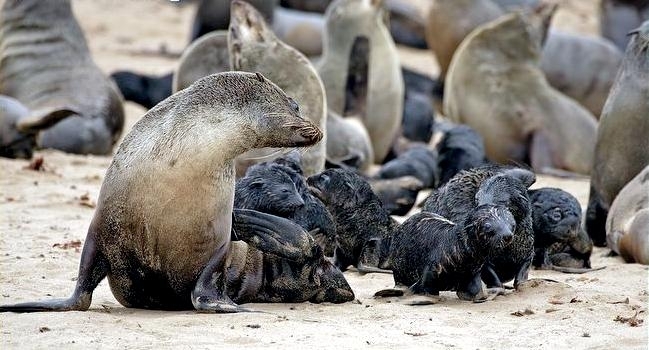 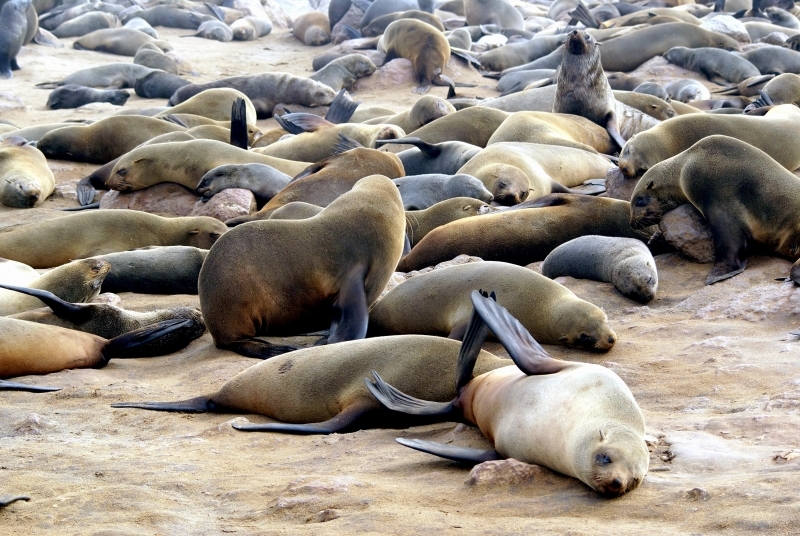 While harem sizes can reach as many as 50 females or cows, the average size of the Cape Fur Seal harem is 28 cows. 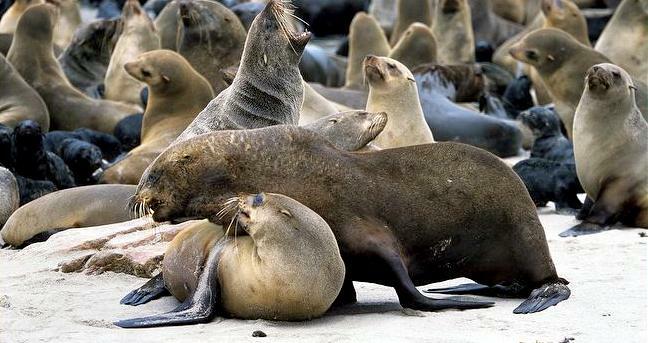 Breeding occurs between the male and each of his harem members. 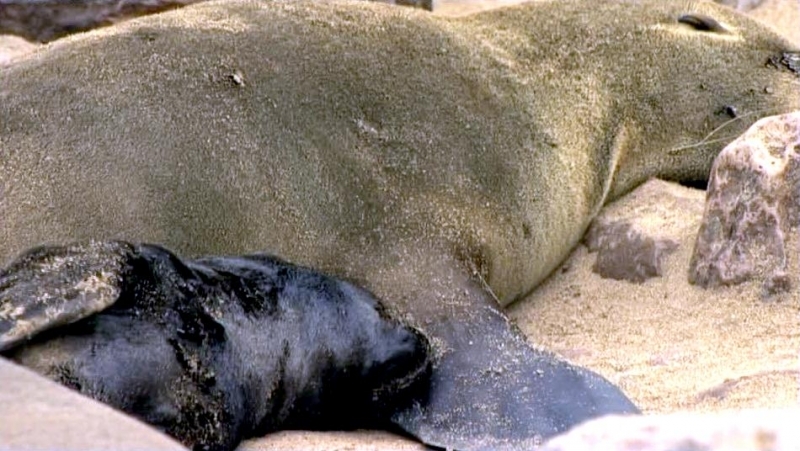 While copulation occurs about 6 days after cows give birth to a single pup, there is a delay in implantation of the blastocyst. 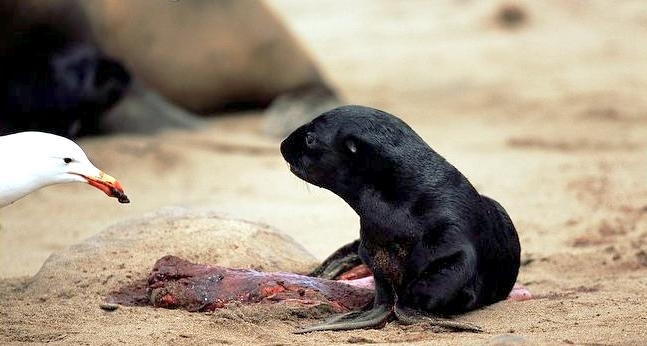 Gestation in averages 11.75 months. 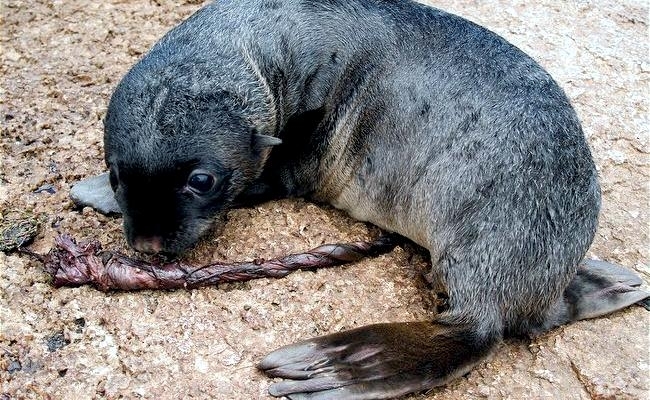 Cape Fur Seal pups are anywhere from 4.5 to 7 kilograms and 60-70 centimeters at birth which occurs in late November or early December. 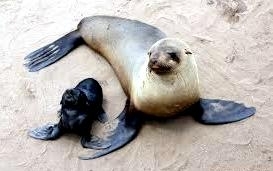 The pups go through two different molts in their first year and a half. 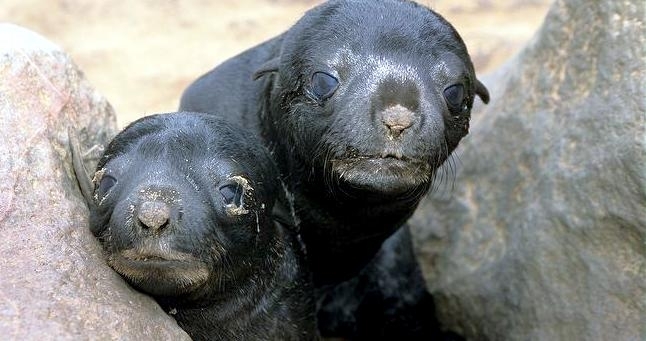 Their original coat is black and curly. 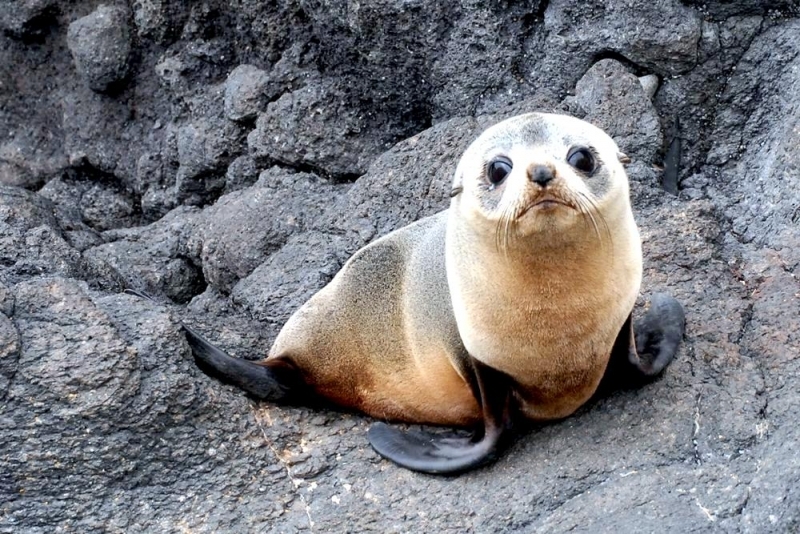 This coat is replaced between 4 and 5 weeks with an olive-gray coat. 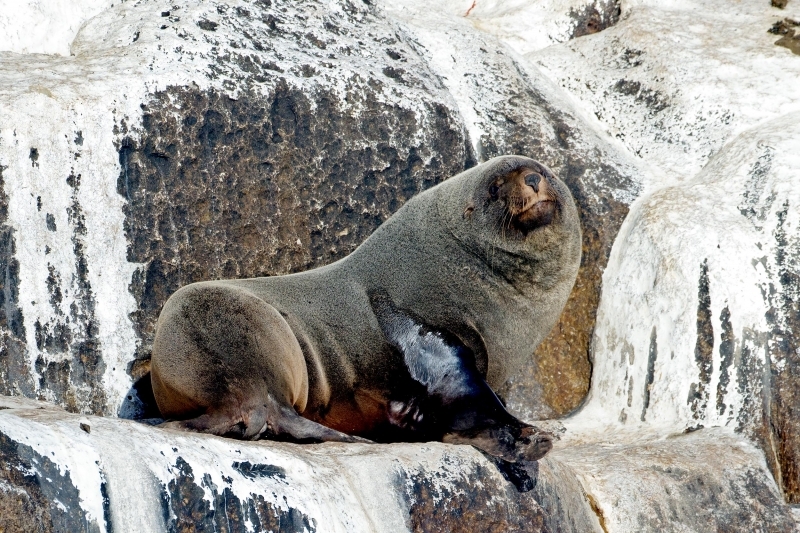 The second molt takes place at about 13 months and replaces the olive-gray coat with a silver one which later fades in color. 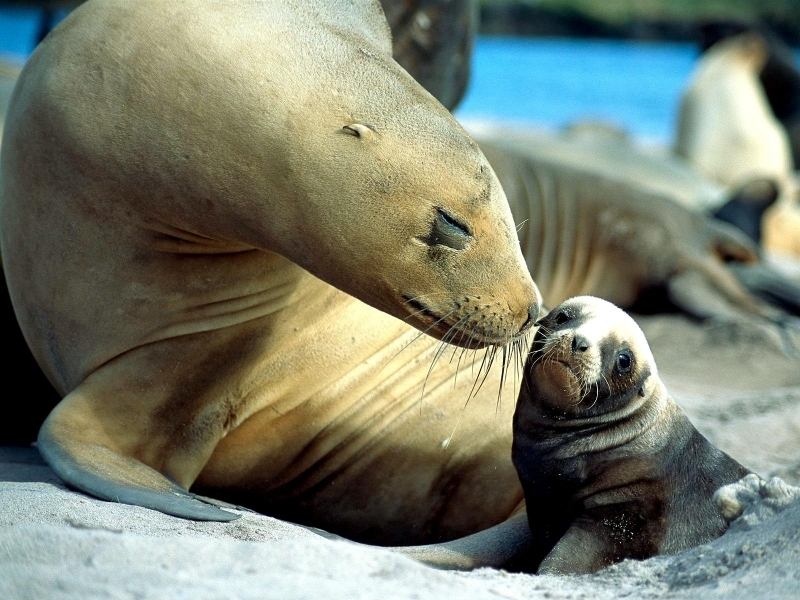 Nursing begins immediately after birth and is continuous for the first six days. 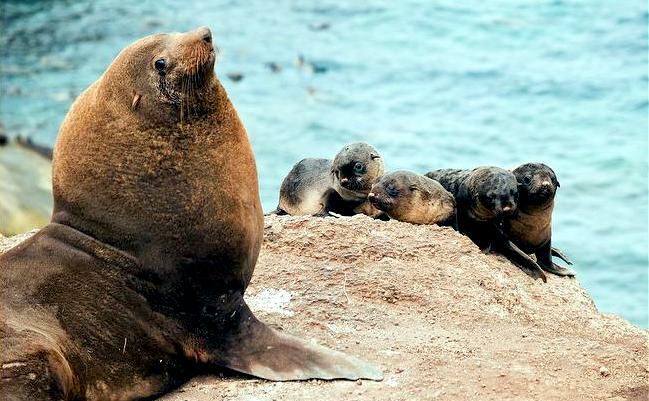 At this time the mother mates with her male harem leader and then begins going out to sea for food for a few days at a time. 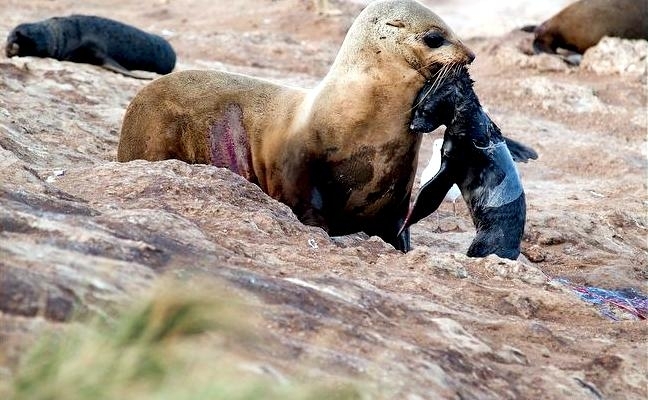 By the second month however, she can be gone for up to 2 weeks before returning to feed the pup. 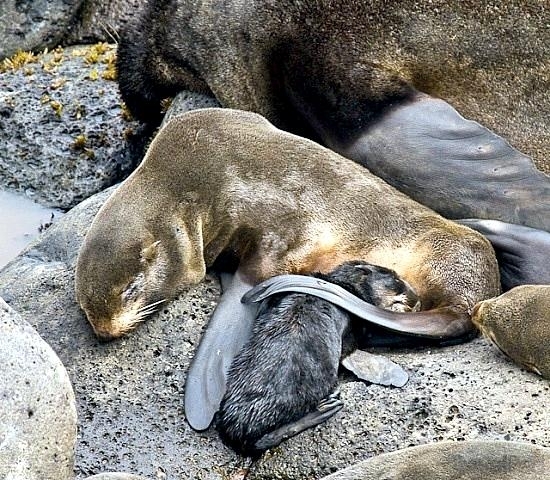 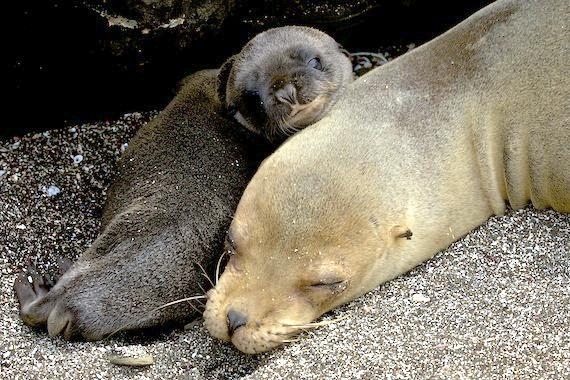 At 4 to 5 months old, pups begin supplementing their diet with crustaceans and fish with the mother’s lactation continuing until the next pup is born. 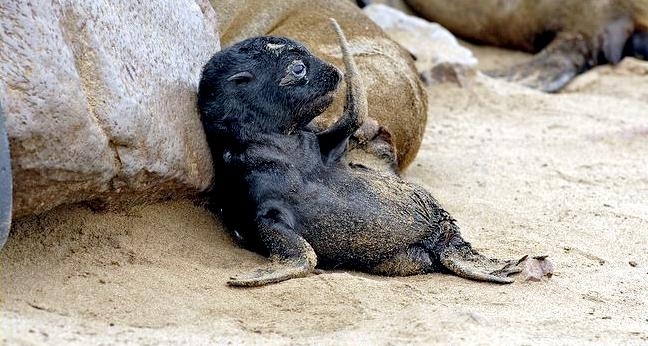 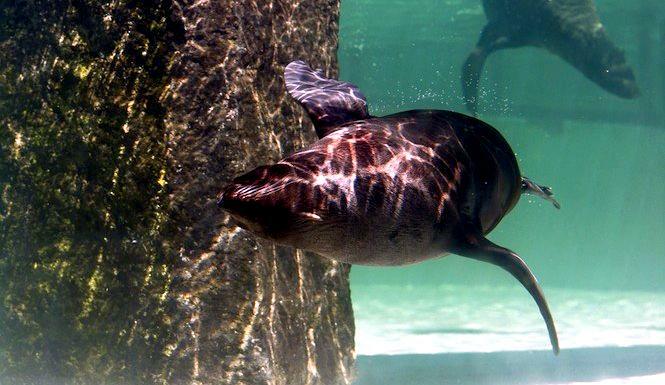 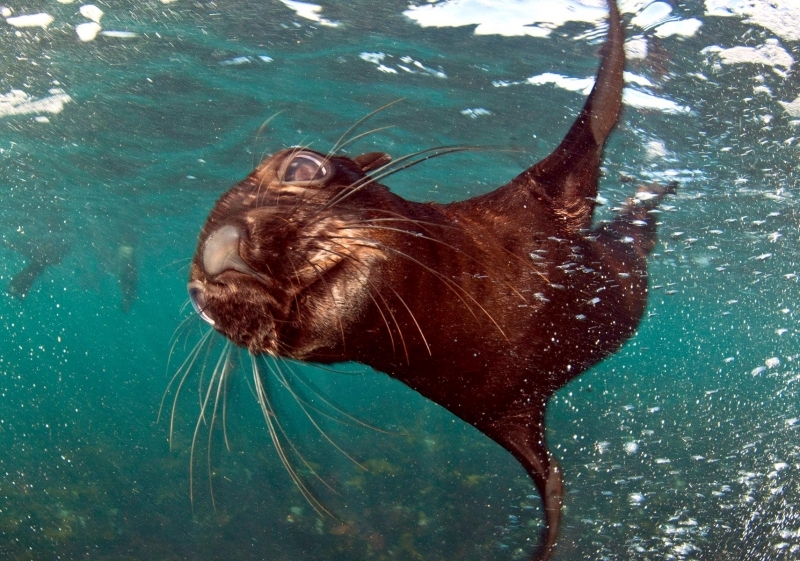 Cape Fur Seal pups begin swimming early and continually increase the amount of time that they can spend in the water. 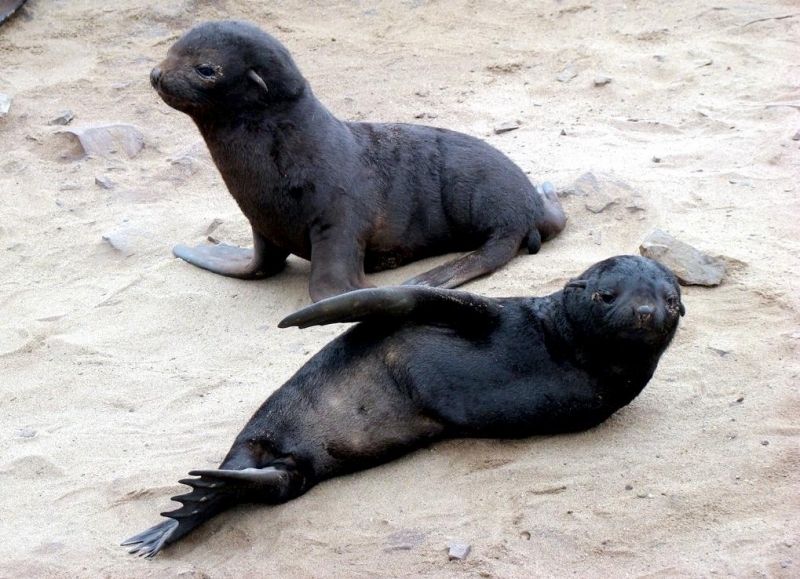 At seven months they can swim for two or three days at a time. 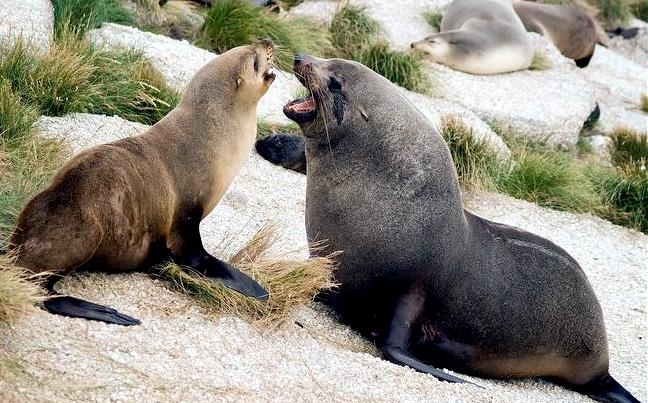 Females become sexually mature at about 3 years and males may also follow this trend but are unable to establish territory at this time so do not usually mate until several years later. 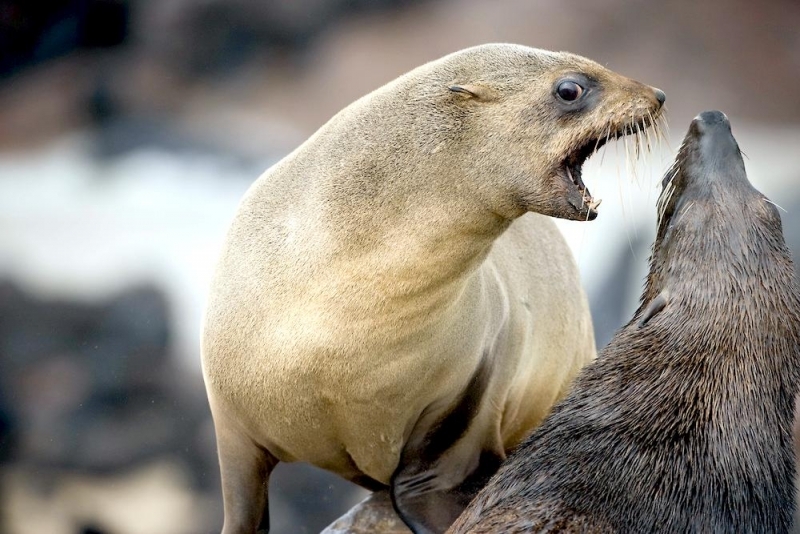 Sexual maturity is widely varied within the subspecies. 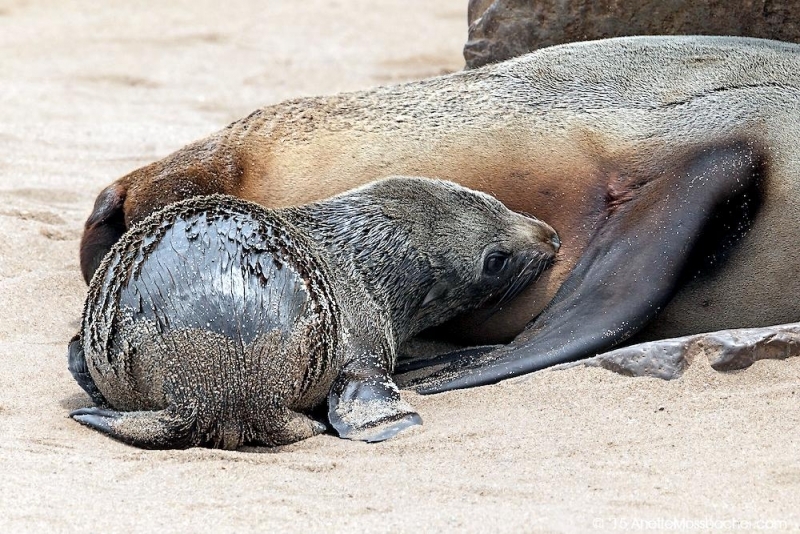 Females reach maturity any time between 3 and 6 years of age. 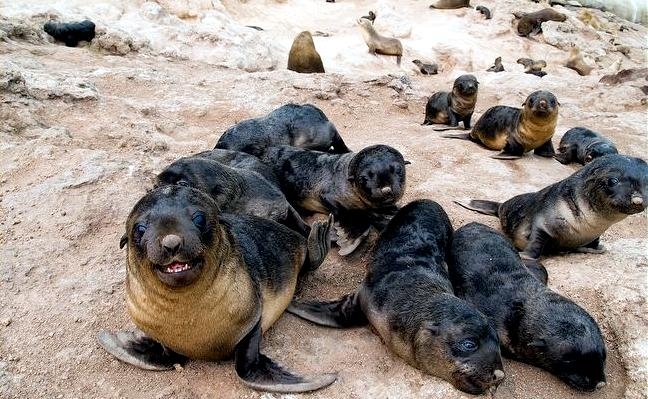 Males probably reach maturity between four and five years of age but cannot hold a harem until they are closer to 7 or 8 years old. 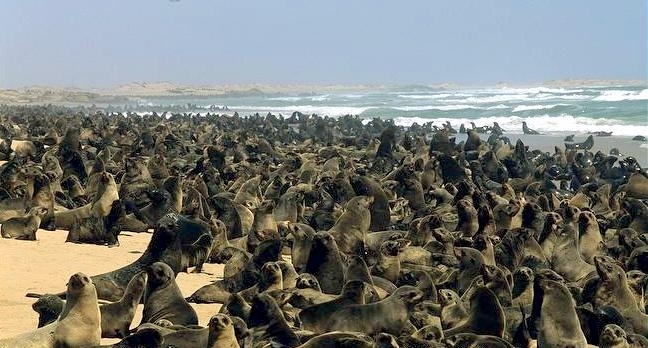 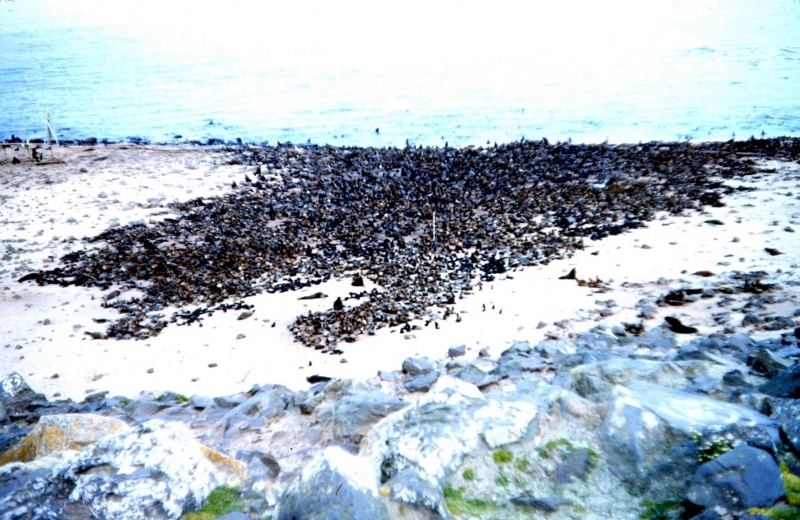 Groups of seals that share a rookery every year are called colonies. 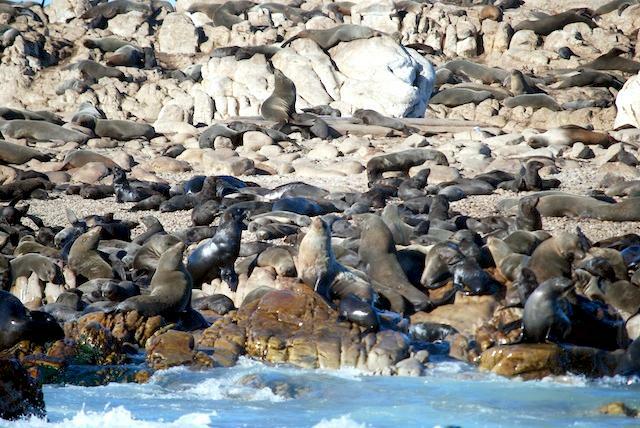 Cape Fur Seal colonies range in size from 500 to 3,000 bulls, although some have been spotted with over 3,000. 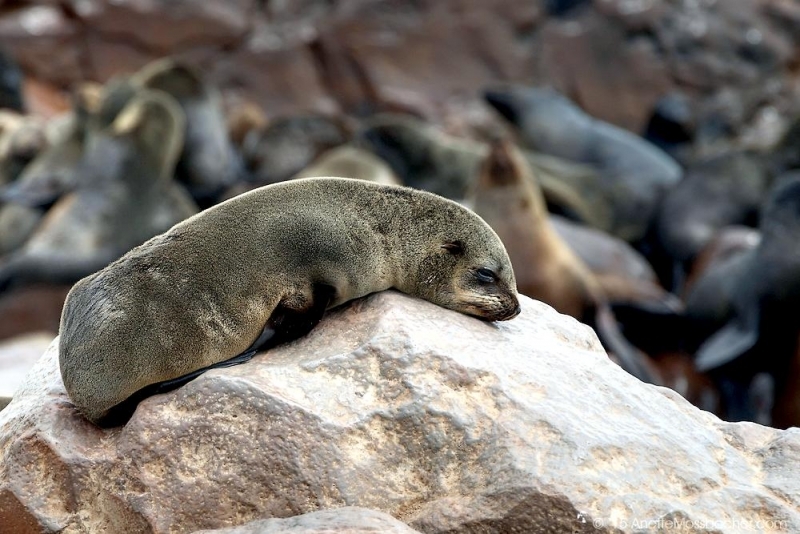 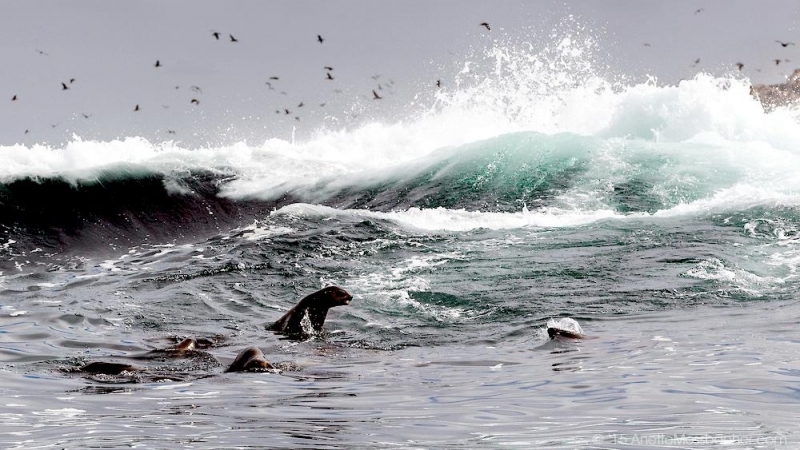 Cape Fur Seal migrate although they never fully evacuate the rookeries since the mothers and pups return to them throughout the year. 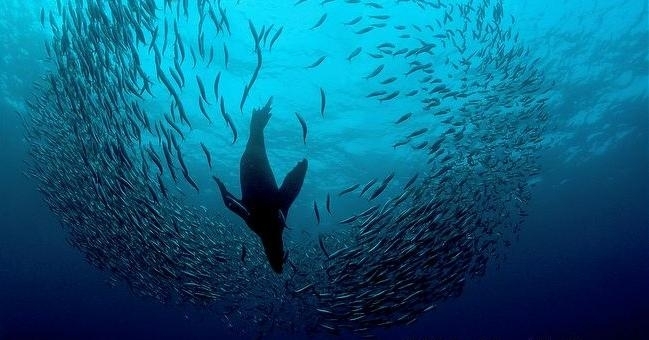 For most of the year however, they are at sea. 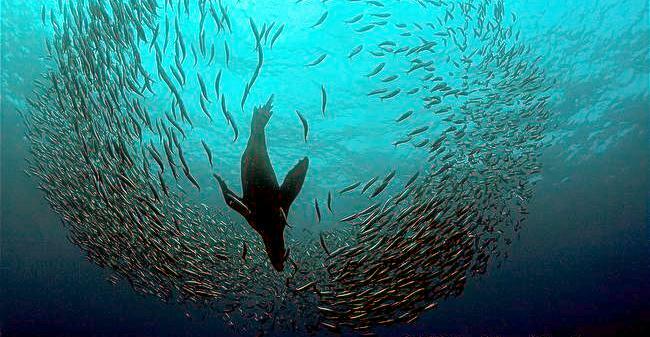 During this time, Cape Fur Seals often travel in small feeding groups. 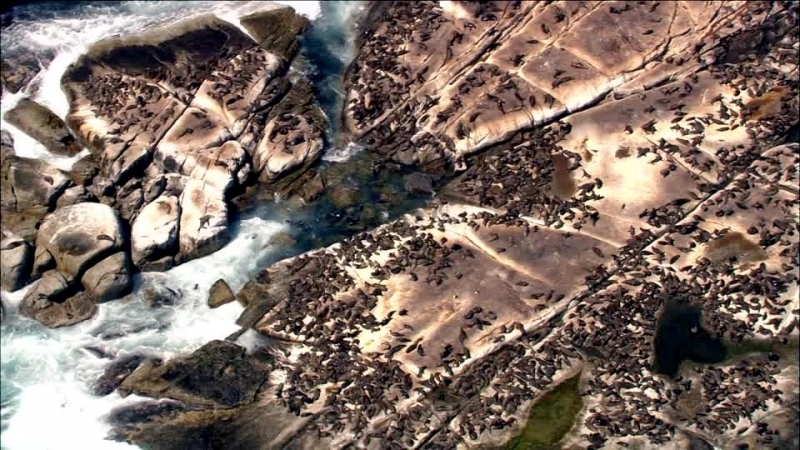 While there is no record of established dispersal some seals have been found in other colonies. 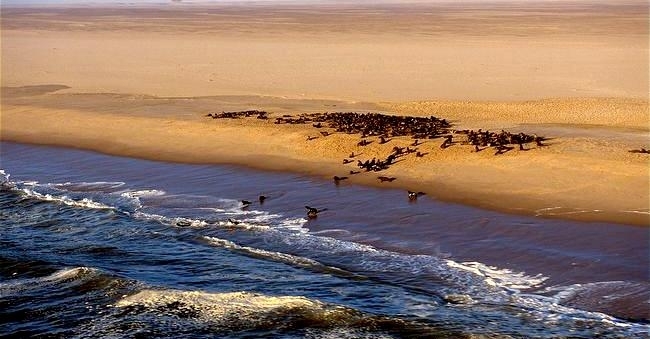 There are no true boundaries between colonies, as they all travel separately throughout the year until the breeding season. 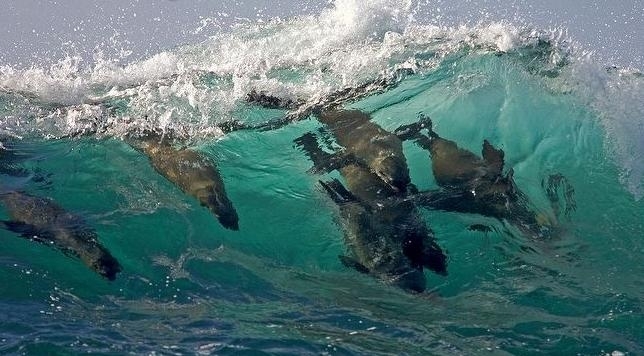 During the breeding season, Cape Fur Seals are polygamous but males do not herd the females, who are free to choose their own mates and do so by the value of their territory. 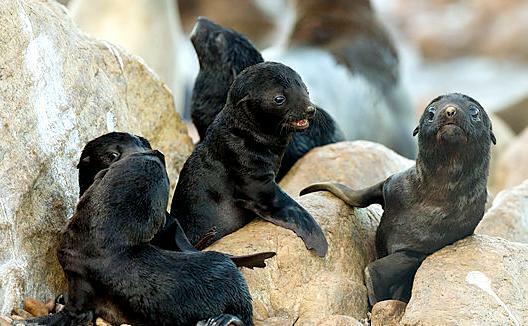 Cape Fur Seals have what is called a pup call. 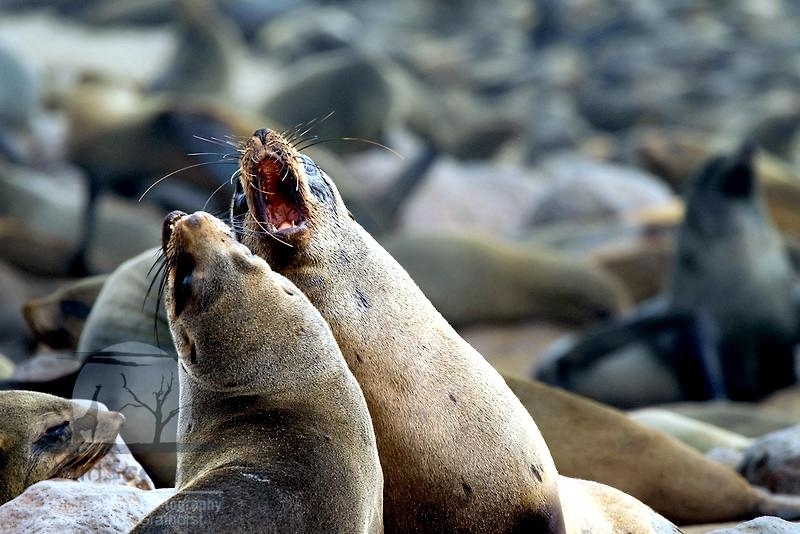 When the mother returns from sea to feed her pup she emits a loud call. 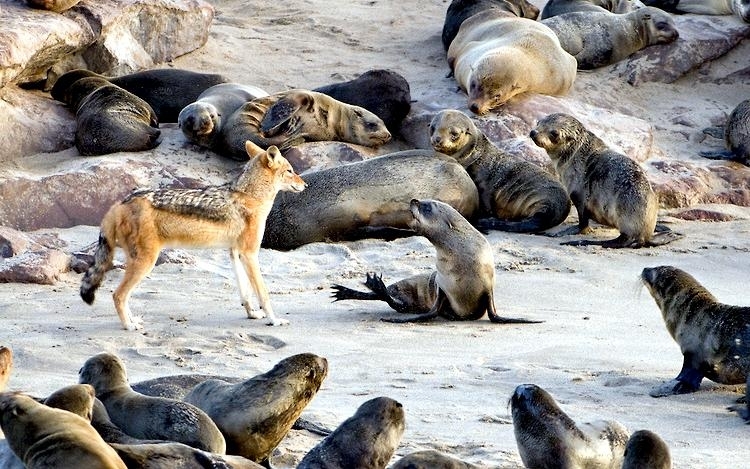 Upon hearing this all of the pups on land come to her but she responds only her own pup. 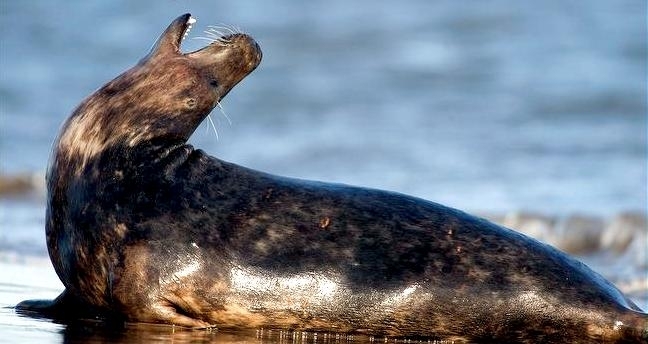 It is suggested that she uses smell, not sight, to distinguish her pup from the others. Pups when alone, stay in groups and play during the evenings. 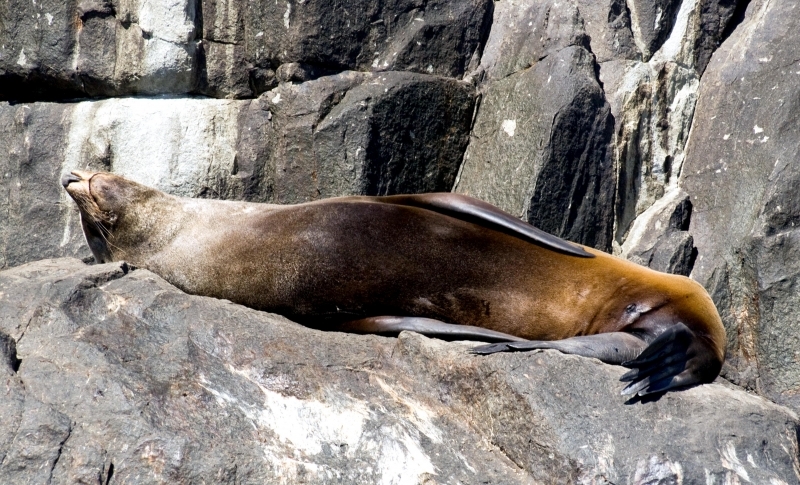 The Cape Fur Seal can be found along the southern and southwestern coast of Africa. 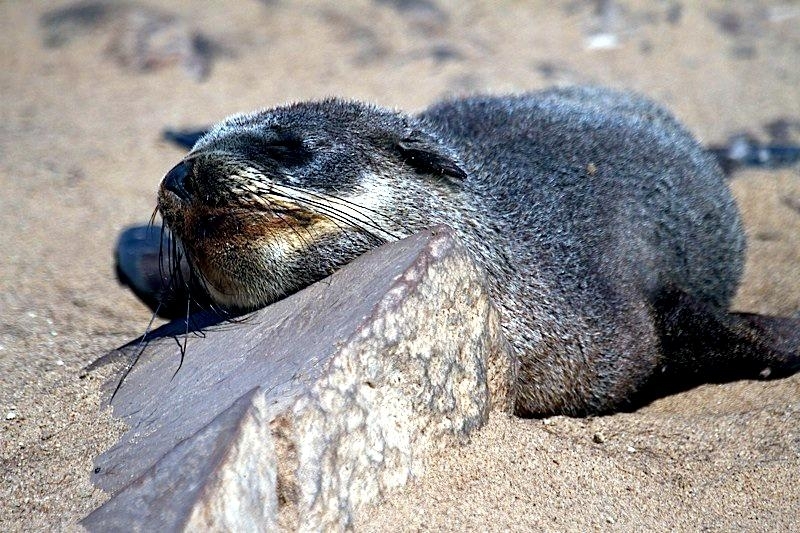 They are commonly spotted throughout Namibia and as far east as Port Elizabeth. 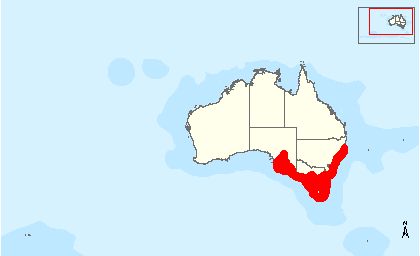 They are also found along the southern and southeastern coasts of Australia. 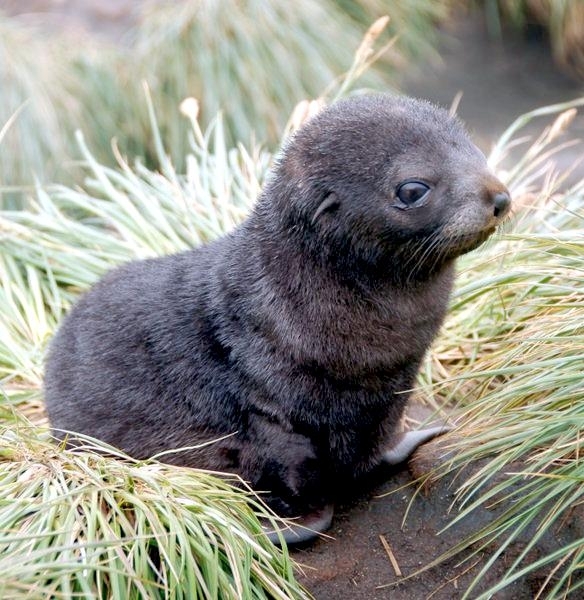 They are commonly spotted in places like Victoria, New South Wales, Tasmania and scattered islands. 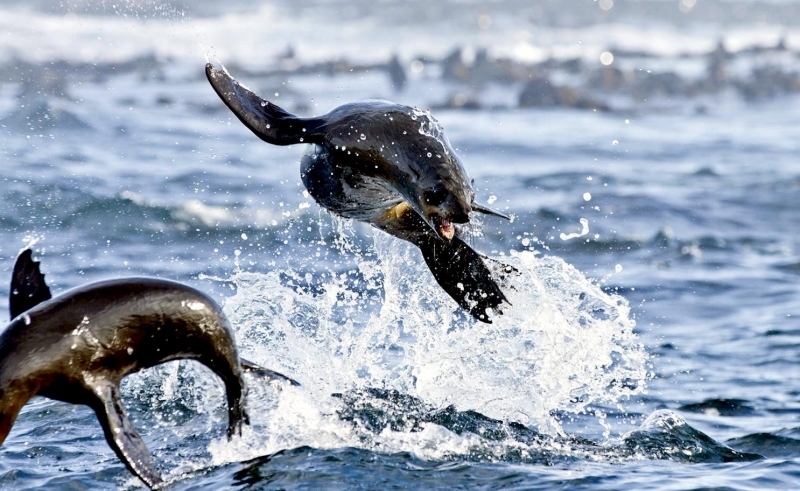 Cape Fur Seals spend most of their year at sea but not too far from land. 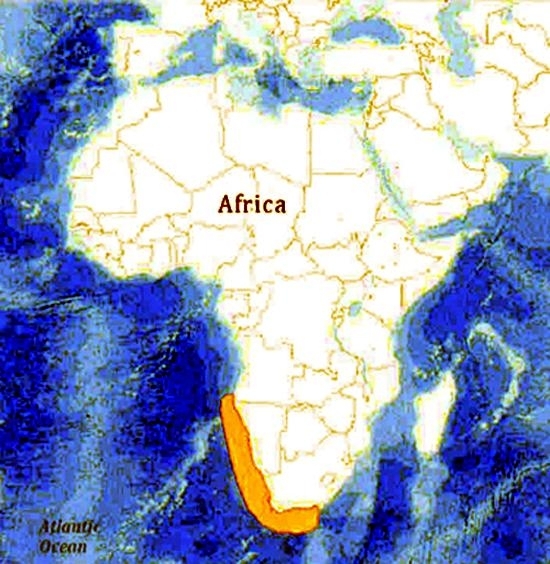 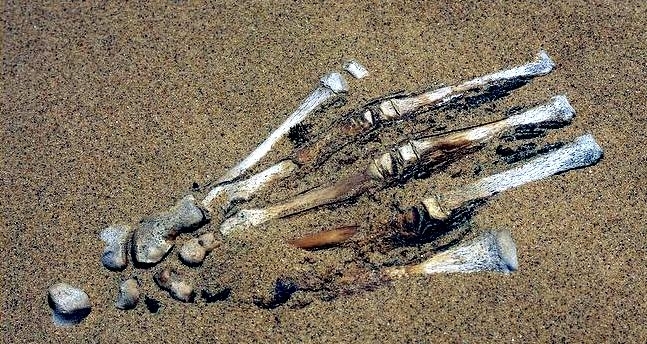 A maximum of 160 kilometers from land is recorded but is not a common. 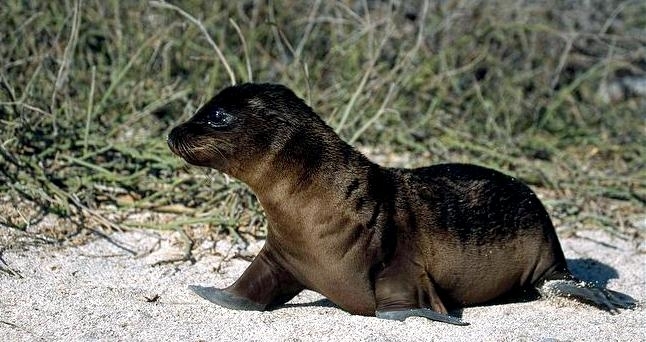 Breeding occurs on the mainland or small islands in the sand or rocks, preferring small rocky islands for mating and pupping. 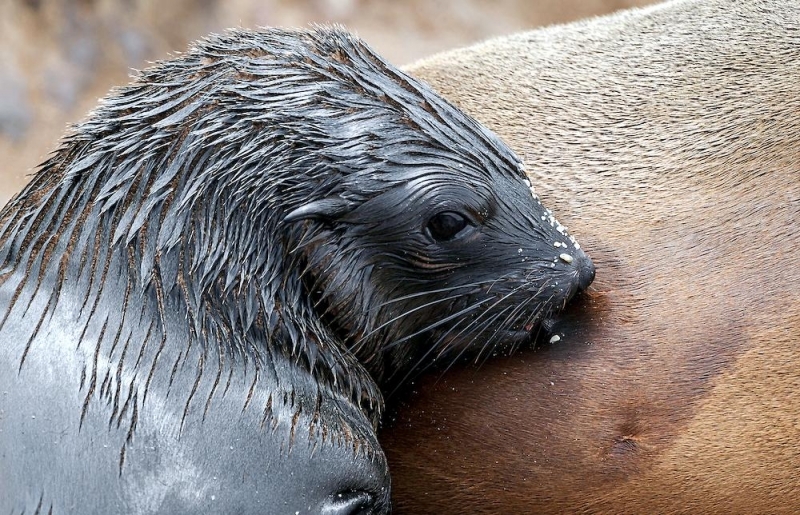 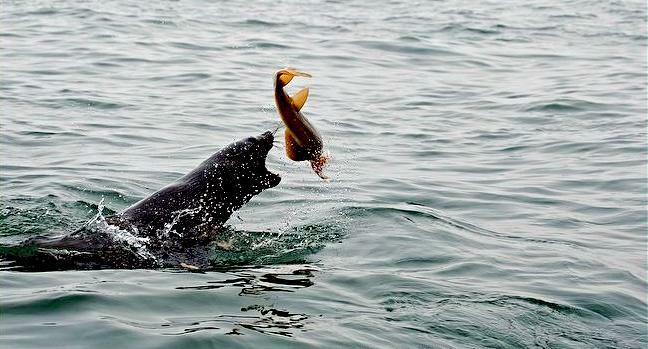 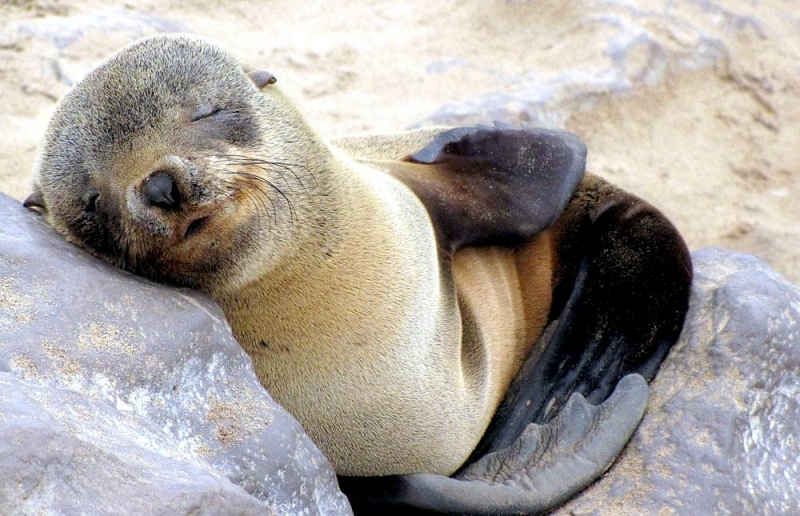 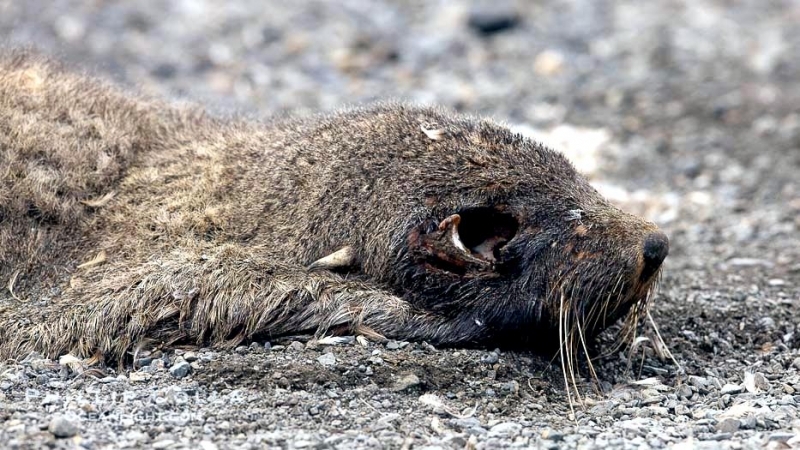 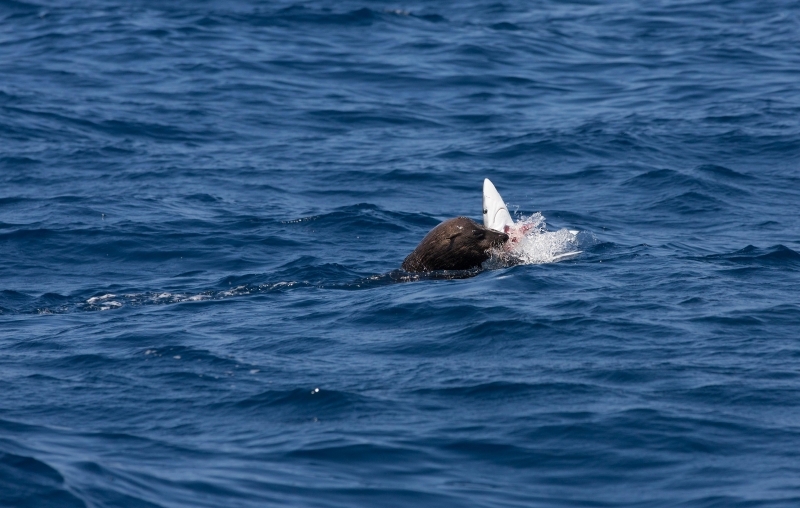 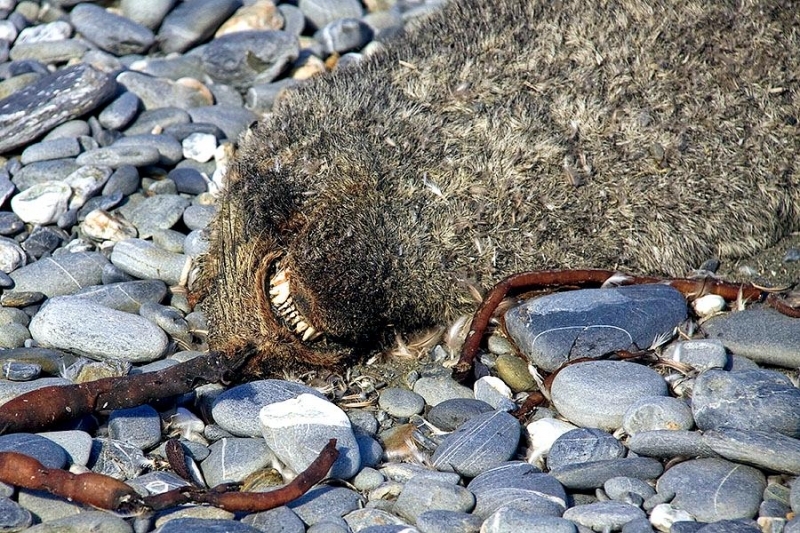 Stomach contents of Cape Fur Seals indicate that fish make up about 70% of their diet, 20% of squid and 2% of crab. 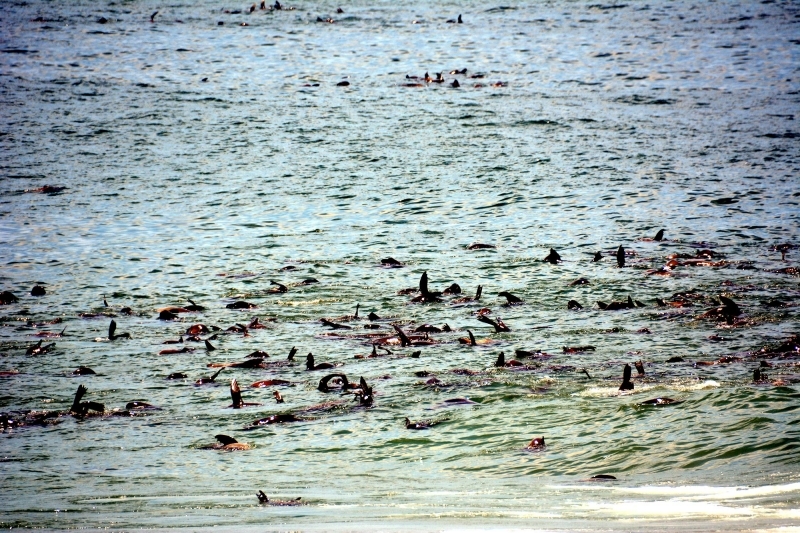 The remaining portion is composed of other crustaceans, cephalopods and sometimes birds, octopus, fish and lobsters. 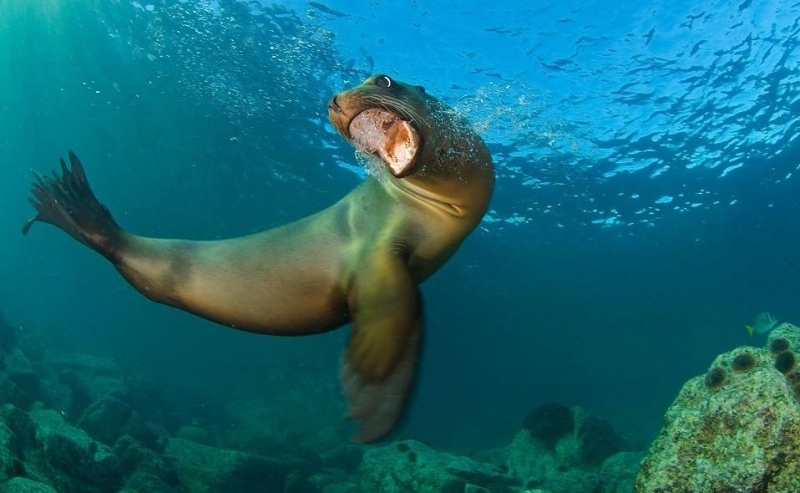 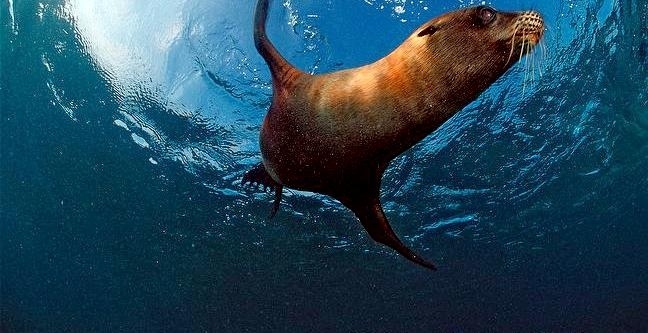 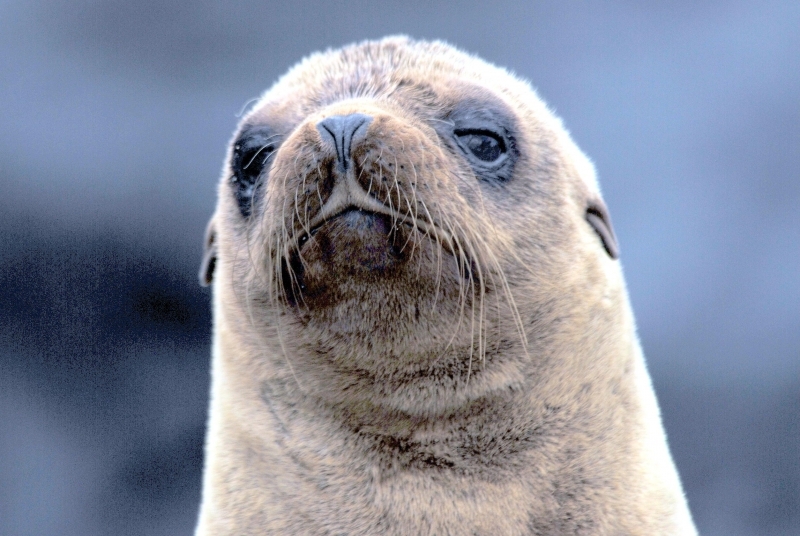 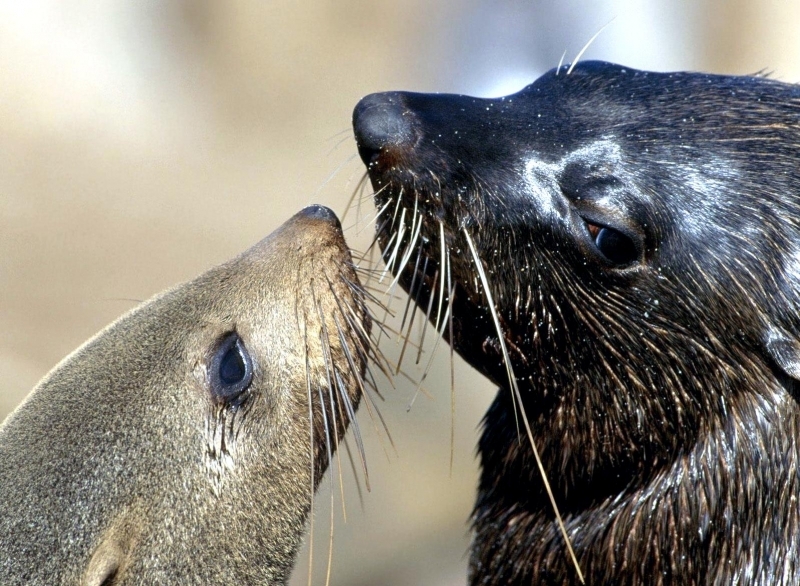 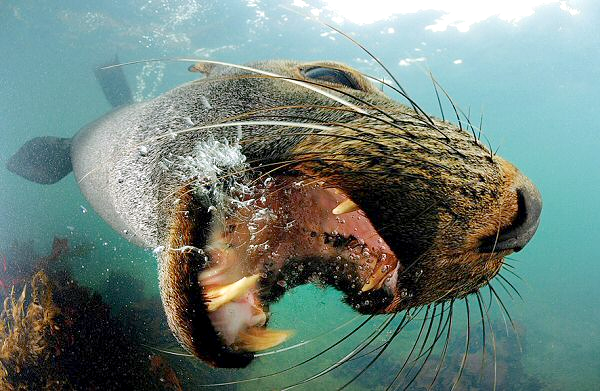 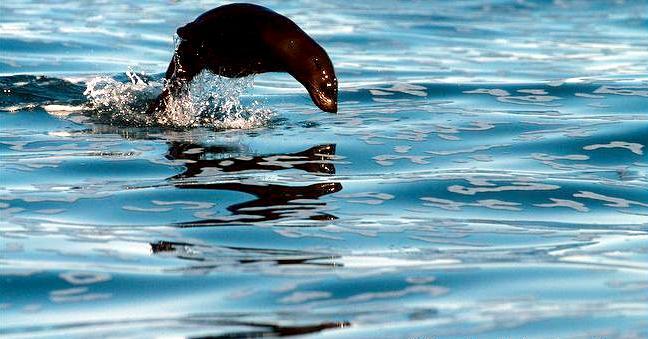 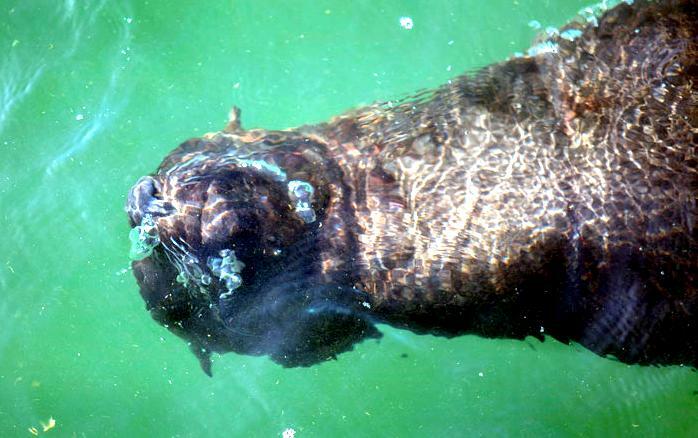 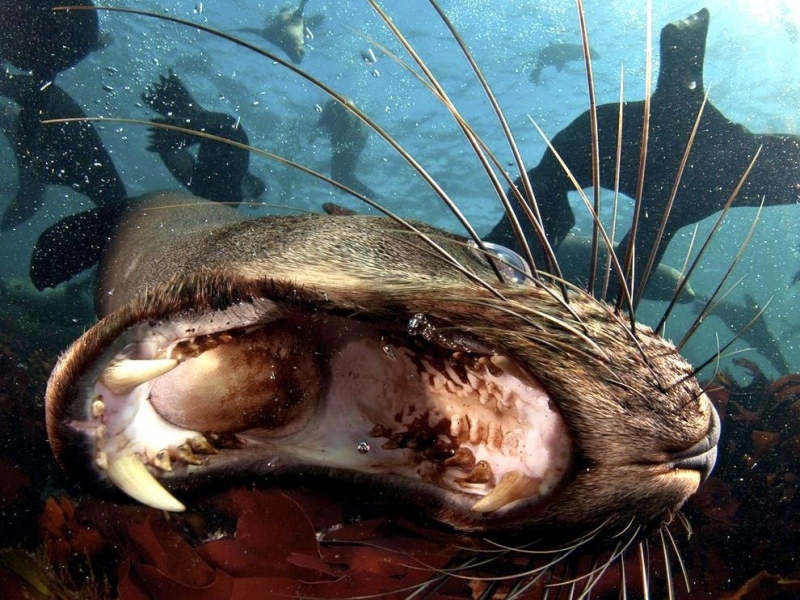 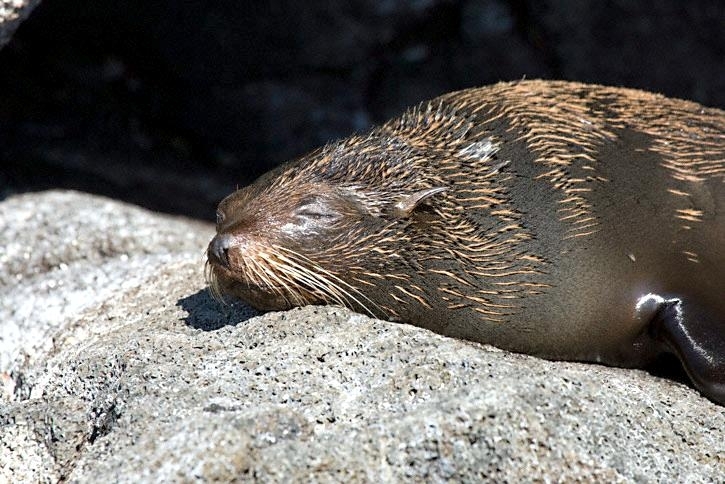 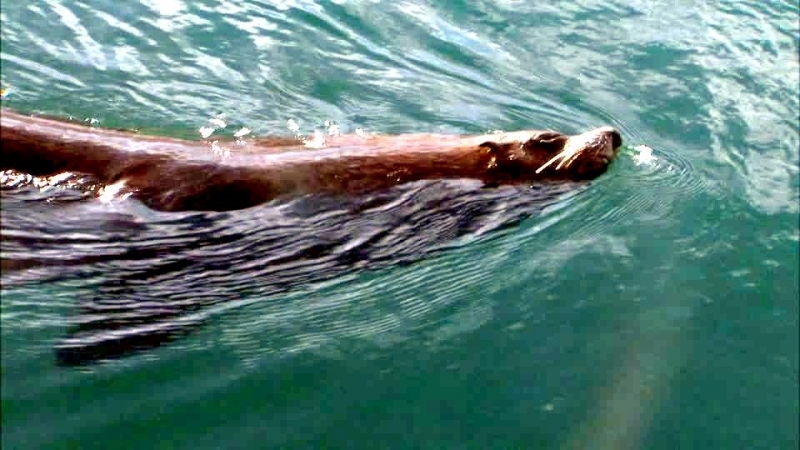 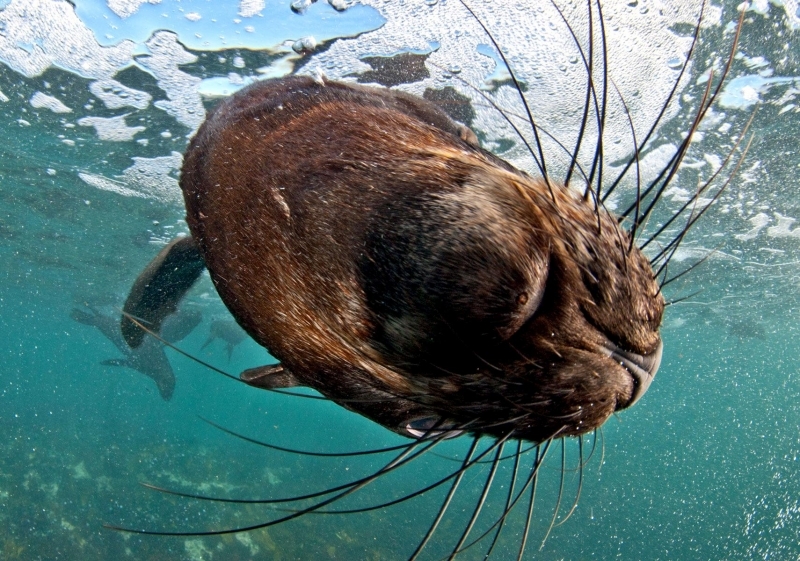 Like most air-breathing marine mammals, the Cape Fur Seal finds its food in the ocean. 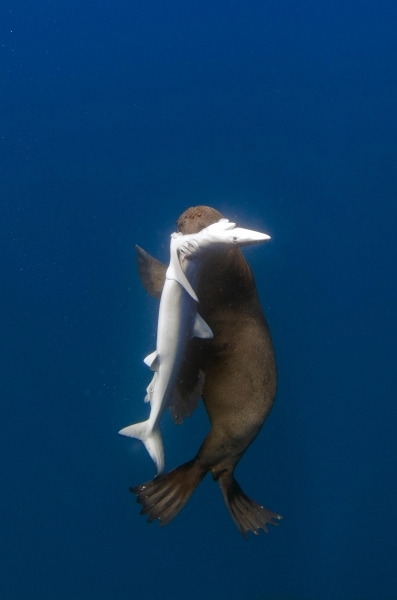 In order to do so it, must store oxygen and swim below the surface to the depth at which its particular prey is located. 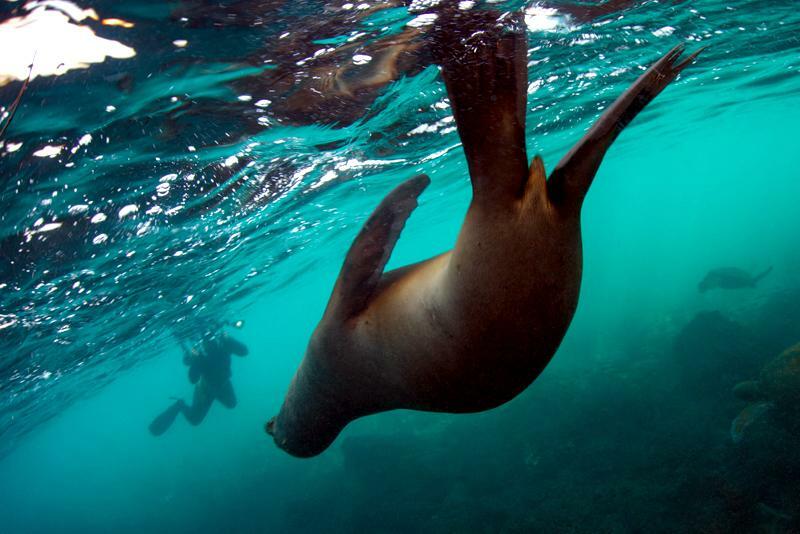 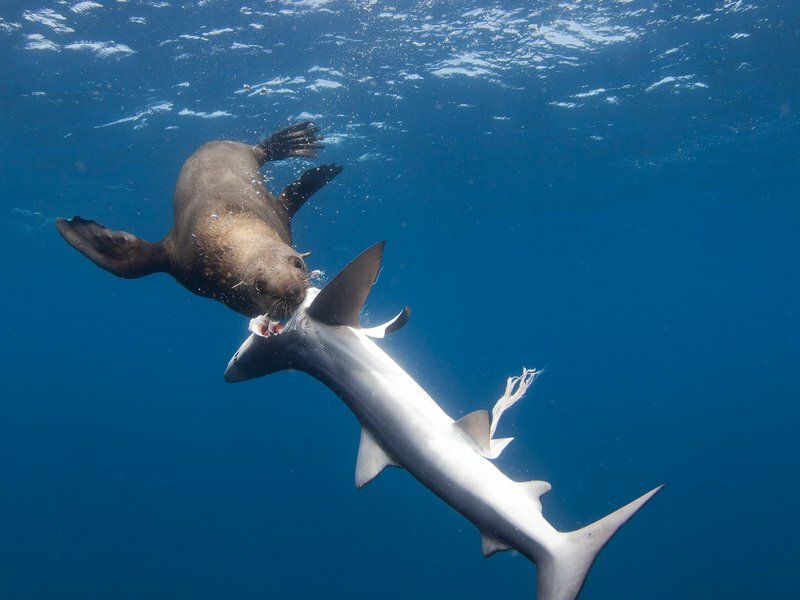 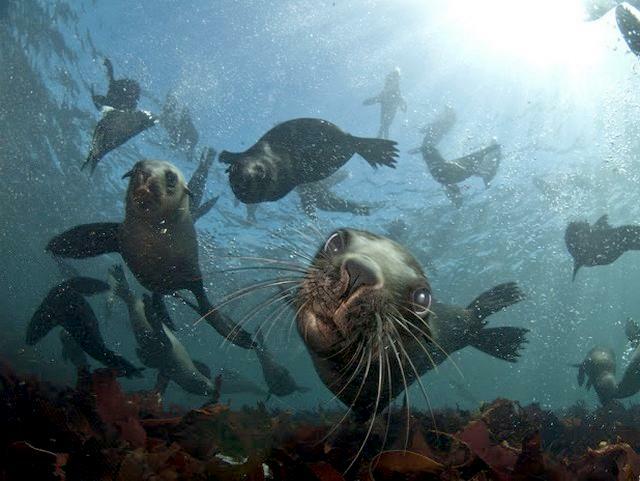 Cape Fur Seals are surface divers with an average dive of about 45 meters and 2.1 minutes although they can dive as deep as 204 meters and for as long as 7.5 minutes when necessary. 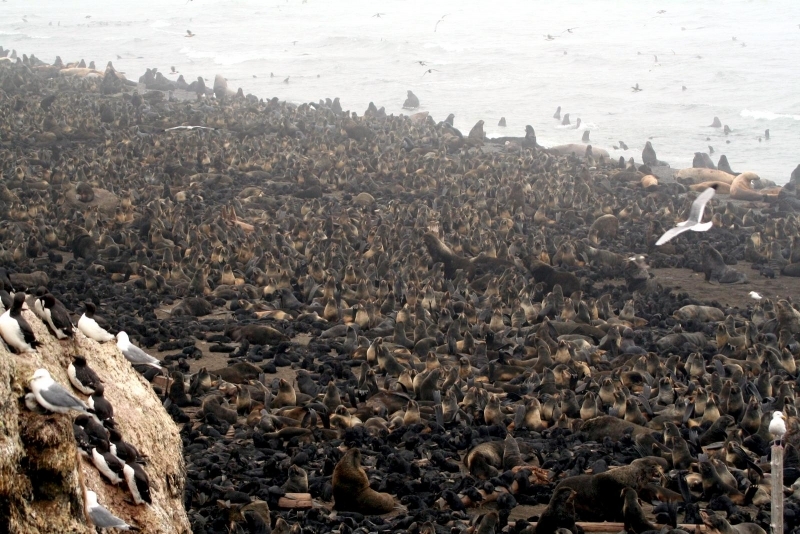 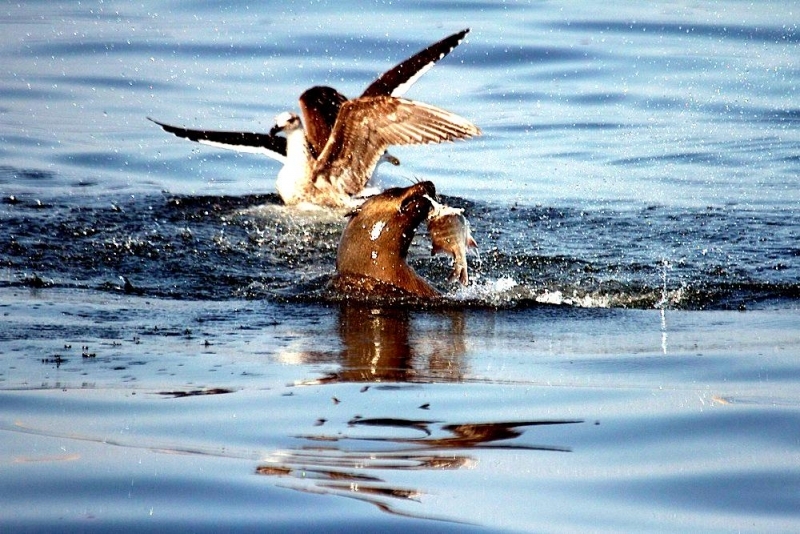 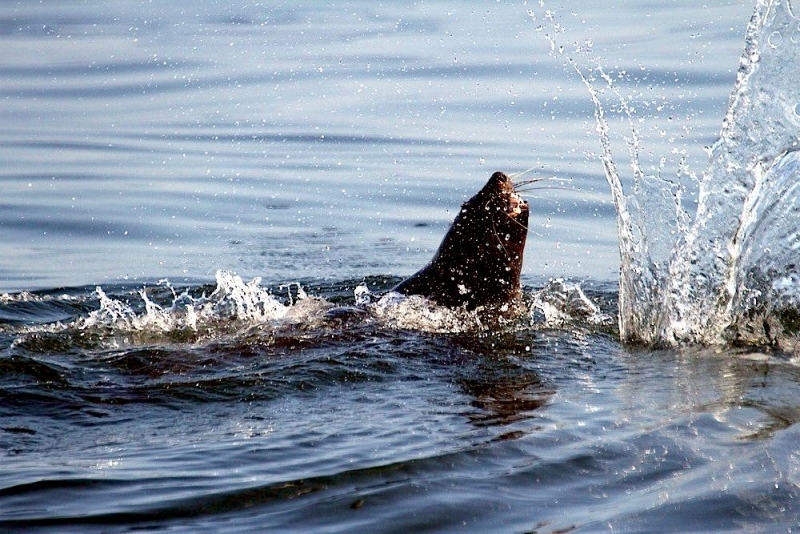 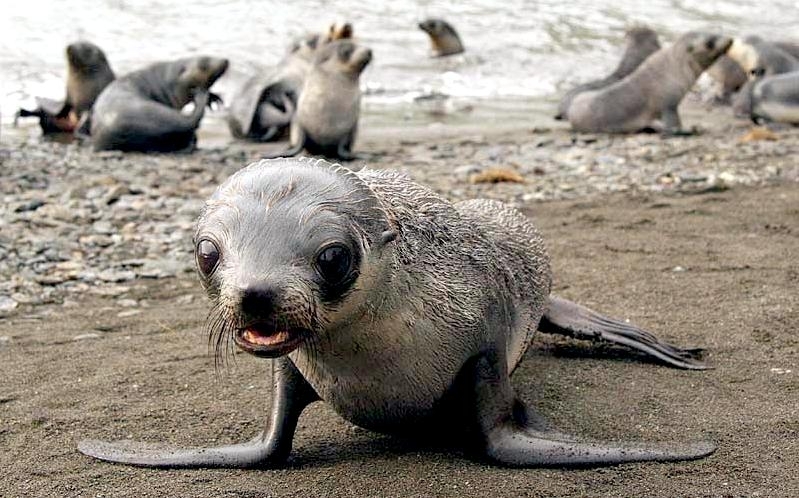 Humans also inadvertently threatening these seals through pollution. 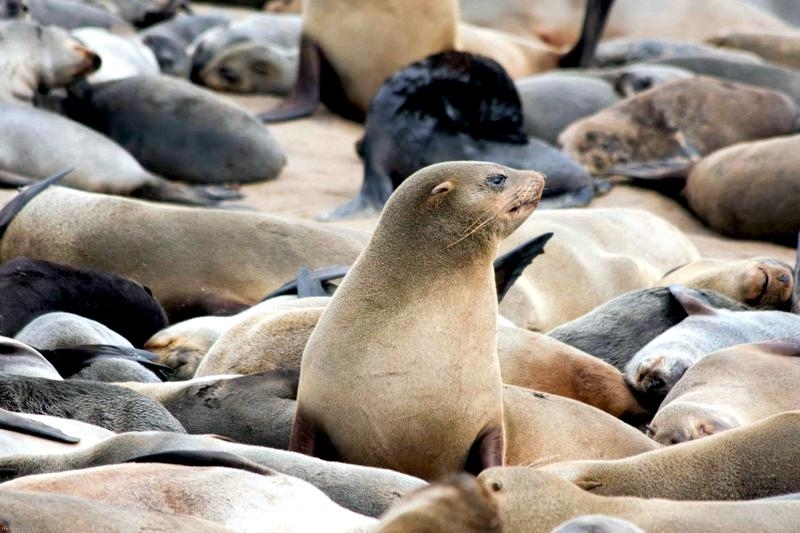 Plastic, pieces of netting and pieces of fishing line kill or injure thousands of these seals a year. 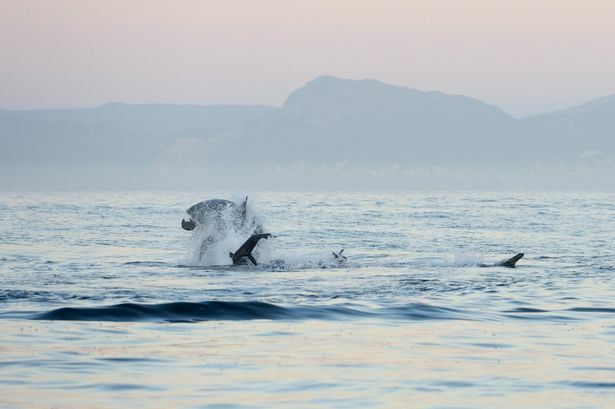 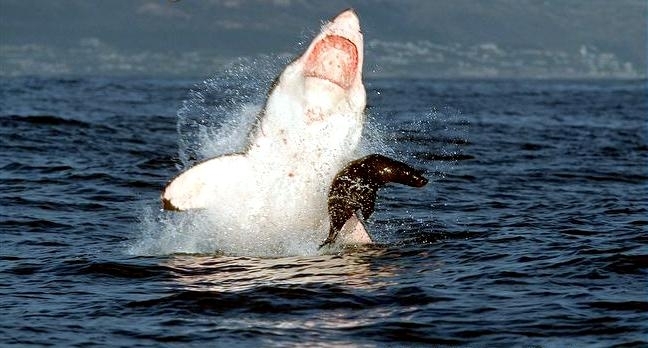 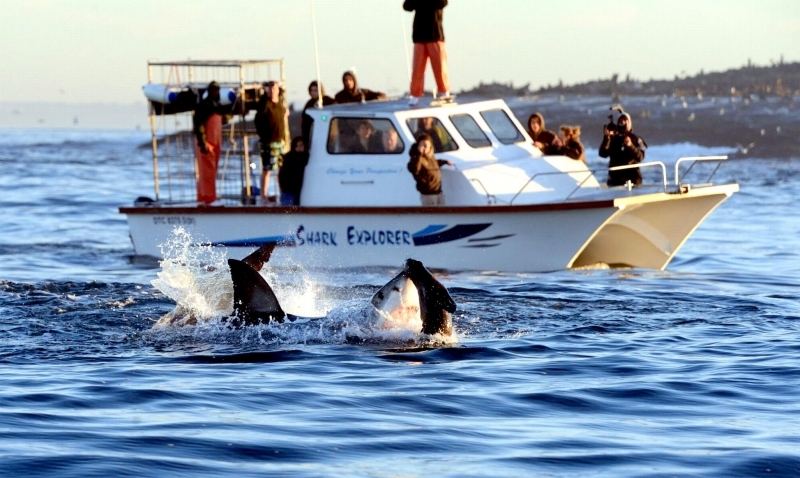 Non-human threats include Killer Whales & Great White Sharks. 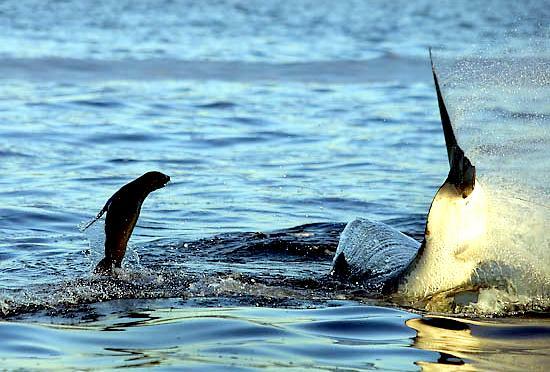 Stingrays can cause some dangerous injuries. 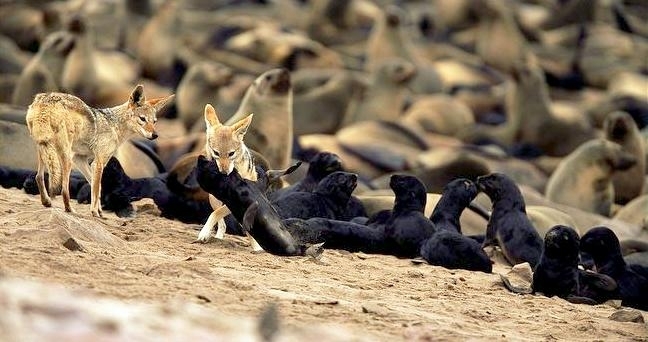 Pups left on the mainland are also sometimes taken by terrestrial predators such as the Black-backed Jackal.